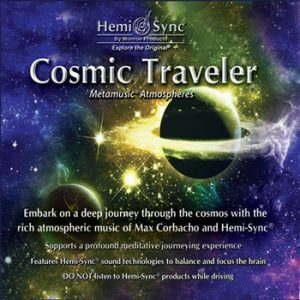 Released exclusively by the American label Hemi-Sync®, COSMIC TRAVELER is a new, enhanced version of Max Corbacho’s 2003 year classic “The Resonant Memory of Earth” (Listen to the original version here:maxcorbacho.bandcamp.com/album/the-resonant-memory-of-earth ). Hemi-Sync® is a patented, scientifically and clinically proven audio-guidance technology refined with 50 years of research. Original music is mixed with complex, multilayered audio signals, which act together to create a resonance that is reflected in unique brain wave forms characteristic of specific states of consciousness. The result is a focused, whole-brain state known as hemispheric synchronization, or Hemi-Sync®, where the left and right hemispheres are working together in a state of coherence.